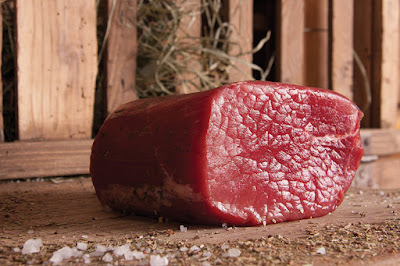 The Tseur Achetaye, a typical Valle d'Aosta product, is indeed a traditional way of preserving meat. Meat from a mature animal (cow, sheep or goat), slaughtered at the onset of winter, is skinned, trimmed and cut into small pieces. Then it is arranged in layers in a wooden cask and covered with salt and various herbs and spices such as sage, garlic, bay leaves and rosemary. The lid of the cask is then closed and weighed down to keep the meat below the level of the brine. These conditions are maintained until the meat is ready to be eaten. After the preparation, this special meat is served raw sliced as carpaccio, or also cooked as a main dish. The uniqueness of the product is that, thanks to this method of preparation, the meat conquers the taste and aroma of the Valle d'Aosta mountain herbs. There are various festivals and events during which is celebrated this typical meat preparation, all falk and of the traditional italian flavor. So if you'd like to enjoy the product staying here in our wonderful land, please visit the website www.leibtour.com. They'll certainly offer a perfect solution for your culinary holiday.